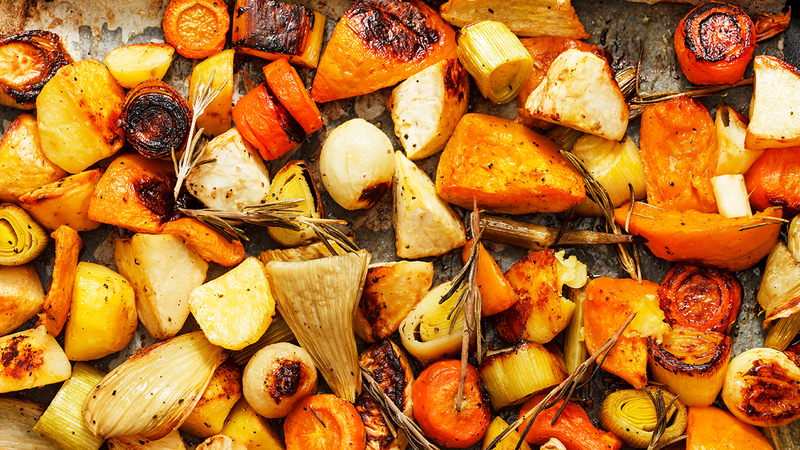 Cut the root vegetables into either cubes or sticks and coat with the olive oil, salt, pepper, and parsley. Place in a single layer on the baking sheet and roast for 35 to 40 minutes, or until golden brown around the edges and crispy. Turn over once halfway through cooking. Remove the veggies from the oven and cool slightly. While cooling, make the dressing by whisking together the olive oil, vinegar, water, maple syrup, mustard, herbs if using, salt, and pepper in a small bowl. Place the vegetables on a bed of greens. Add some dried cranberries and walnuts and drizzle with the balsamic maple dressing. Store extra dressing in the refrigerator for up to 5 days.Serve warm or at room temperature. delicious salad. using the extra dressing on all sorts of things. great way to use up some of the root veggies from our CSA box.